As ataxians progress the choice of a bed becomes more and more important because of spinal surgery, joint and/or neuropathic pain, positional issues, etc. Below are inputs in chronological order over some years as they were made on FAPG and INTERNAF that might be helpful to someone seeking a better sleeping experience. We bought a Latex bed that is adjustable. It has worked out great and it is very comfortable for my daughter. We bought Sleepy's store brand and it was a lot more affordable than the Tempur-pedic. We got our son an adjustable Tempur-pedic bed. It was costly, but it must help him get a better rest - when he slept on a conventional mattress, post scoliosis surgery, he moaned through the night. He can now read in bed or watch movies comfortably. He sleeps very quietly. Our medical supplier let us know when our daughter got her first power chair that if once you qualify for a power chair you qualify for a hospital bed--although you still need a prescription from your doc. Our daughter has had one for the past 4 years and with multiple layers of memory-foam (started at 2" and now is 6") it is very comfortable. We bought our son a queen size adjustable Tempur-pedic bed several years ago. I consider it one of the best investments we've ever made (it wasn't cheap, but has proven well worth the cost). He has always said that it is the most comfortable bed he has ever had. I originally wanted it due to the fact that it eliminates pressure points. It has done that, he spends increasingly more time in bed, and his skin has never had any breakdowns. When he was able to watch TV from bed, it was great for that also. We use the massage feature often; he has hip pain almost constantly now. I can see how being able raise the head of the bed would help a lot with transfers, he hasn't been able to transfer for many years. It helps me if I'm by myself and need to change his shirt, I don't have as far to pull to sit him up, while trying not to let him tip over. Since my husband has switched to an air mattress bed that sends pulsing waves of air through alternating channels, his sleep is much better and his soreness reduced. I have a profile bed and swear by it. Because the knees and head can be adjusted, itâ€™s almost like I can move the bed to fit the positioning of my body. I now have an excellent nightâ€™s sleep, which makes all the difference to how I manage through the day. By the way, for those with the sleep number bed, be sure to open them up and check for mold often. For some reason, those beds have a history of mold problems. We got our son one of those foam beds a few years ago. We went from a single to double, because he moves all over the bed at night. We use a low platform on the bed as it was easier for him to get in and out of it. Since then our daughter has used a Queen mattress. Recently we bought one that you can adjust --head and feet up and down, with a foam mattress--she loves it. We had it made by a company in OH which put a thick topper on one side and a thin one of the other so we could turn it if we needed a different softness. My wife and I got a sleep number a few years back, and we will never go back to a regular mattress. I was having back pain, and out of desperation, we got a sleep number, and voila, my back pain went away. We recently visited my sister and brother-in-law, and they had gotten a Tempur-pedic mattress long after we had gotten our sleep number. They were good enough to let us sleep in their bed for the weekend, but sleep didnâ€™t come easy, as the mattress had already gotten "memory", and my back pain came back from just sleeping on it for two nights. I couldnâ€™t wait to get home & sleep in my sleep number bed to relieve my back pain. Weâ€™ve had our sleep number bed for over 6 years, and although the ends of the mattress are beginning to sag from me getting dressed while in the seated position, itâ€™s still a godsend for sleeping, and my back pain. I purchased one of these (Rotec Multi-Positions) for my daughter last year for after her spinal fusion. It was the only one that I could find that came in a double-I like to jump in with her from time to time to watch a movie! You can get it in white which looks nicer for a female. She loves it. Has her own remote-it is height adjustable, both head and feet can raise and you can get it with the massage feature. I didn't as it already cost me $4600. He now has a Tempur-pedic mattress and adjustable box spring, in full size (double). It has improved his sleep, though he doesnt realize it. I have a baby monitor in his room to hear him, and he used to moan and groan all night. Now, except for the occasional coughing fit from his saliva (usually before midnight), he sleeps so soundly. Everyone in the house wants one, too! My daughter just got a memory foam mattress topper pillow, and loves it. She does not move much in bed these days, though she still can. We switched to a Number bed after my hip surgery. With the waterbed I couldnâ€™t get out of it. The sides were too large making a pit to get out of. The Number bed is a combination of foam and air blasts with a pump that adjusts the air blasts. I typically sleep with it pretty soft around 35-40 and my wife use 45-50. However in the morning I set it back too 100 and it makes getting out of bed very easy. Also when we are sore from (either lack of exercise or too much) we adjust the pressure to relieve the pressure points. It was awesome after my hip surgery. They also sell the frame insert to work like an adjustable hospital bed. My daughter has two 2" memory foam mattresses on top of her bed. They have really made a huge difference in her ability to get comfortable and she very rarely has back aches now. Now that I think about it, around the time we got them was when she stopped having trouble getting to sleep. I would recommend them for all of our FA kids. My son - 29 (155 lbs.) loves his new mattress pad! The combination of the pad and the Lyrica (for leg spasms) is helping him sleep better. This is what he ordered: 4.2lb twin XL 3" memory foam mattress pad topper w/cover. Pay attention to thickness vs your weight and softness vs firmness. We got one daughter a craftmatic full-size bed. It has a built in massager that really helps her back and legs. We got our other daughter a queensized Tempur-pedic with built in massager. It has helped both girls having the ability to raise not only their heads but their feet. Sometimes one has her feet higher than her head but she says it helps. I know that the beds have helped with their breathing problems and their many pains. Pricing is different for both but we went with what the girls wanted. The bigger beds help them move around in bed better. They also help keep them from falling out of bed. We now have free-standing trapeze bars for each bed and they not only use them to reposition themselves but also for upper body exercises. For those having difficulty swallowing small pills, or perhaps having difficulty keeping track of them in their mouth, try buying empty pill capsules and put the small pills in the capsules. Size of capsule depends on how big and how many small pills there are. After asking about what to do about cold feet, I remembered I had made a warming pad for a friend with FA, years ago. I headed out to the fabric store today and bought 1/2 yard of a cute cotton print, and a 1/2 yard of a light weight polar fleece to make a cover for the pad. Finished foot warmer will be about 18 inches square. Here's the construction diagram. When I got home, I sewed the selvages together on the cotton and turned it right side out and pressed it flat. I then stitched midline from the fold to the selvages, to divide it in halves. I made "channels" by stitching side to side, across my midline stitches, and leaving the ends open. I made about 6 channels, but it isn't critical how many. I didn't want the rice stuffing to shift to leave empty areas. Then I took basic old dry rice, and a bit of rosemary leaves and some lavender and mixed them together in a bowl. I put about 1/2 cup of the mixture into each channel on one side. I waited to do the other half until this side was finished. Being careful not to spill, I took this back to the sewing machine, and rolled the open edge to close it and top stitched it to seal it all together. I lay the pad flat and smoothed out the rice evenly and then carefully smoothed the rice away from the middles of the channel so I could stitch one more row across them (in the same direction as the "midline" stitches) to hold it in place even better. I repeated these steps with the other half or the pad. I took the polar fleece and made an envelope by folding it up at one end, enough to cover the rice packet, and stitching the side seams on that area. That left a long piece as a flap. I left that to either put under her feet, in bed, with the rice packet over her feet, or over her feet if the rice packet is under her feet to help hold the heat in. 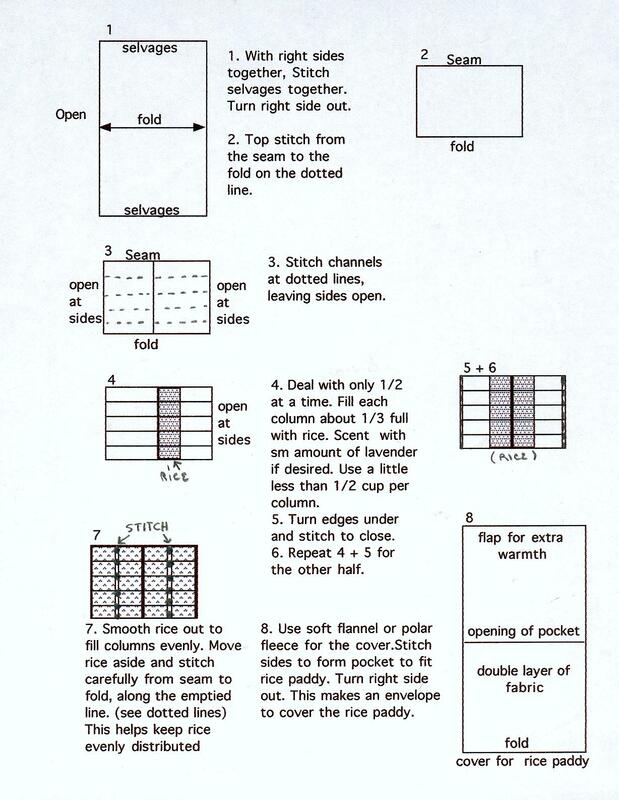 Note: There should be a dotted line in picture 2 from the top line to the bottom line seam to fold. In the plumbing section of a hardware store you will find a cast iron floor flange used to anchor outdoor railings. The part looks roughly like the classic martian spaceship; round, flat on the bottom, a half inch or so circular flat area on the outside of the other side (4 mounting holes are spaced equally around this area, the center of the other side is rounded, and there is a threaded hole through the center (half inch pipe thread). Take the floor flange to the electrical section of the store and find a compression fitting. This is a cylindrical piece with a half inch pipe thread on one end (comes with a nut; throw it away) and the other end will properly force fit into the floor end of the arm (take off the rubber foot first!). You'll need wood or concrete screws for the flange while you are in the store. I only used 2 per flange but the bigger you are the more screws you'll need (my daughter is a lightweight). Be sure you take one of the arms with you to the store to confirm the fit while you are there. Screw the floor flange and compression fitting together, put it on the floor in an open space and then push the arm down onto the fitting using small circular movements at the top of the arm while pushing to help the progress. If you are a nitpicker (like me) align the mounting holes to the arm before you push the arm on so that the hole pattern will look straight/square/nice when you put the arm back in place. Now reinstall the arm to the commode and adjust the arm to the best height/angle. Now screw the flange to the floor. Yesterday I got the "Iron Quick Ironing System." It is advertised to 'cut your ironing time in half'. I don't know about the rest of you, but it takes me forever to get something ironed and I've been avoiding it as much as possible. This 'system' includes a reflective heat ironing board cover and an iron 'shoe'. It was kind of tough for me to get the self adhesive ironing board cover on, (perhaps this should have been done by a non-ataxic person) but the ironing part is a breeze with this stuff. I highly recommend this to EVERYBODY. Especially those parents worried about their ataxic kids at college or even just fiercely independent types. I got it from Sears. They call it 'The original Iron Quick System'. It is also available on the internet for a slightly higher price, plus shipping, as "Iron Wonder". My son *Aaron-21, who has FA , has been having trouble with his transfers because his ankles sometimes buckle. We have found some ankle splints/braces that are really helping. They are called "Sure-Step" articulating ankle/foot splint. His orthotist said that they are especially helpful for varus-valgus control of the ankle. I guess that means that they hold the ankle firm side to side, but still allow for flexion of the toes up and down. Our insurance covered them with a doctors prescription, but for someone who doesn't have insurance coverage, they would be $62.00, at the clinic we went to (Rehab Designs of America). They are molded plastic with foam/felt liners that can be replaced. There is a hinged molded heal plate that is attached, as well as two velcro closures. I'm not endorsing this product for everyone, but they sure were the right thing for Aaron at this point in time. *Note: as of 2004 Aaron is wearing AFO's that fit high calf. *Note: Brianne Konanz has used Sure Step ankle braces, as well. Trilok Braces - they are complicated to put on at first. McDavid Ultra Braces - easier to put on but didn't seem to support as well. -- Amy K.
Brianne used Ankle Huggers for some time to stabilize her ankles in the chair. They worked well. See also this page. On the subject of footrests: Yes I agree that because footrests add considerable length to the wheelchair, decreasing it's maneuverability, it is tempting to leave them off indoors. The downside is that while your toes or the balls of your feet may still rest on the floor, your heels (or at least mine) do not. As we should sit with our heels slightly lower than our toes, this is bad practice, and will encourage your calf muscle to contract and the toes to point. I've got two suggestions....I use an ergonomic footrest beneath my computer desk to keep my feet raised in the correct position. I got my dad to make a footrest from a piece of thin rope threaded through a hard plastic tube (cold water pipe) about 14" long. The rope has a loop at either end and hangs onto the normal footrest support bits leaving the pipe about 2-3" off the floor. I can rest my feet on the pipe in the normal "out in front" position or they will tuck beneath when necessary for moving through tight spaces. Just thought I had I share a handy hint using velcro that I saw. I recently went some friends' place for dinner (they are not ataxic or anything either!) and I noticed a strip of velcro (the 'hooked' side) fastened to the wall in the kitchen. I asked what it was for, and they replied "tea-towels". Apparently they just "slap" towels and cloths in the general directon of the velcro and it sticks - when they want to use it again, they just pull it off and slap it back again when finished! I thought this idea was so cool! - and of course the idea would be so useful for those of us with ataxia too - say in the bathroom, kitchen or even wardrobe. I use the same idea you have of the tea towels with the button etc..., but for my son with FA, in wheelchair and living alone, I've made his towels with the strap that goes through the towel wrack or bar, and on the oven door, and bathroom, I've used Velcro, at each end of the strap, one hook side and one of the loop side, so they close on each other. When dirty he pulls them apart, and puts them in the wash and they are easy to re-connect. I liked the hint on using a wire brush to clean the hooked side of Velcro! I have created a cover for the scoli-brace so the kids don't have to wear a t-shirt. Kids can even wear tank tops. Those under shirts always slide up and around. If any one is interested call me or email me. We recently purchased a Multichair 5000 (by Nuprodx) as a Christmas present for the girls. After using it I feel it is a wonderful thing for my husband and myself. We had looked at 3 different products that were similar. The thing that made this particular chair stand out was that it was easy to dissemble and travel with. We took it with us over the holidays and it made the bathroom accessible for the first time at my in-laws. We had to take out a loan to purchase it but it proved to be a blessing the first day we had it. I see posts from parents with young FA children and thought I would share some simple adaptive things we use. I'm sure many already use these but if not, take a look. We bought cool step stools and put them in front of all our sinks. They have nice handle bars up the side and the bigger one our 6 year old can even lean against. We put felt pads on the bottom so they slide out of the way easy enough. I found them at mystepstool.com. I also adapted a stool for Adrian. It gives his back good support and plants his feet. I raised the seat up at first but as he grows I just cut down the bottom of the legs to lower it.